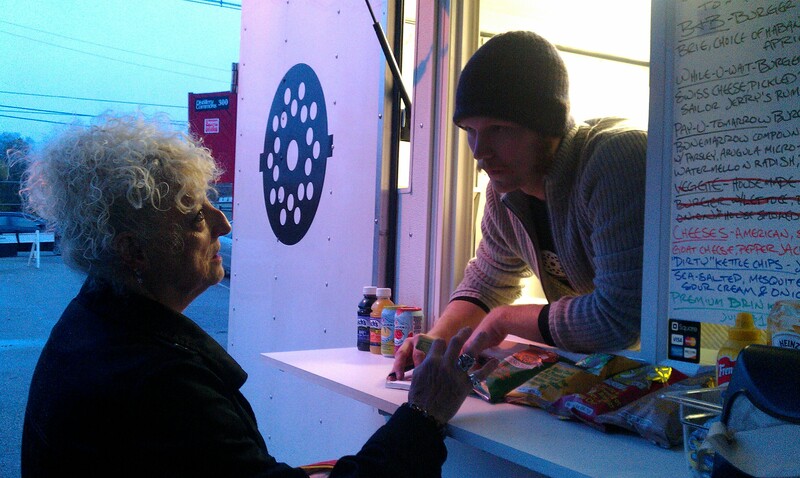 Mary, one of my Moth StorySLAM buddies, getting a burger from Grind back in October. This could be you. Sometime around the new year, the Ashlee Eats Facebook page hit a great milestone — 100 fans, baby. I think that calls for a giveaway. Liz and Jesse, the couple behind the Grind gourmet burger truck and favorite of Ashlee Eats readers, have offered up two vouchers for a blog giveaway, each worth one burger from the Grind truck. These would be great to use at Truckin’ Ain’t Easy, a food truck gathering at Apocalypse Brew Works on Friday, Jan. 25 (click here for more details). What’s your favorite burger from Grind? If you haven’t had one, what kind of Grind burger would you like to taste? For a chance to win one of the vouchers, leave a comment on this blog post or the Ashlee Eats Facebook page. Just one comment per person, please. Post your comment by 11:59 p.m. Wednesday, Jan. 16. I will randomly choose two winners (one voucher each) on Thursday and post about it. And thanks for reading and liking the Facebook page! I’d love to try the b&b burger! The B+B is crazy delicious! My fav is the Local Love Burger they did for the food truck local event. I haven’t been but I want to try the grind burger! Haven’t been…so something incredibly messy – perhaps with a fried egg and avocado sounds awesome! I would love to try the veggie burger! the “you’re gonna die anyway” was fantastic! B&B (Apricot Jelly) is amazing. That one with the marrow butter was the stuff! I’ve heard so much about their veggie burger, so that’s what I would like to try! I’ve only had the veggie burger, and I adore it. It isn’t often that a veggie burger is given the same thought and attention as a regular burger. B & B of course! I’d love to try the original Grind Burger! B&B with Apricot Jelly is the bestest. While-U-Wait sounds really interesting – I’d love to try it!